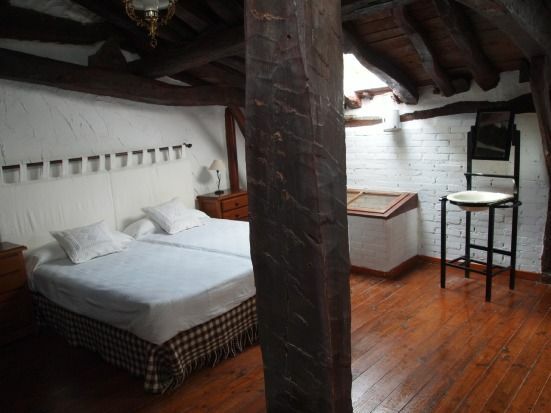 Villapajar is an old hayloft rehabilitated on the medieval wall of Villasur de Herreros converted into a rural house. Its thick walls provide silence and the river, with its orchards and gigantic poplars, offers beautiful sights and sounds. In the interior it surprises the beautiful: the enameled fireplace, the drawing of the beams and walls, the skylights, the attic and everything that transports us to the past. But with comfortable beds, newly renovated bathrooms and all services. The garden of Villapajar are the banks of the river; and the patio, the entrance square to the house. Children can play with peace of mind because there is no danger. The environment of the house offers a variety of activities and routes: 4 km, the Uzquiza Reservoir and the Green Route of the Sierra de la Demanda, 13 km., The Atapuerca and 26, Burgos with its cathedral, both Patrimonies of the Humanity. And we wait for you! Estuve con mi familia éramos 12 y estuvimos muy bien. La casa es encantadora,los alrededores muy bien,y la propietaria pendiente de que todo estuviera bien. Hemos estado el fin de semana del 12 al 14 de febrero 12 personas ( 6 adultos y 6 niños) . La casa muy bonita, confortable y con todo el equipamiento necesario. Hacía mucho frío fuera pero en la casa hemos estado muy calentitos. Hemos pasado un fin de semana estupendo. Otilia, la dueña , muy amable y servicial. Volveremos en primavera seguro.